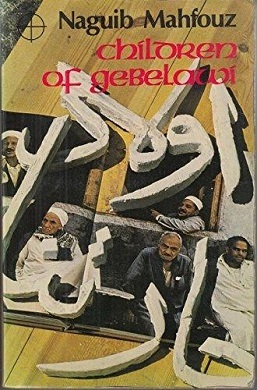 Children of Gebelawi, (أولاد حارتنا) is a novel by the Egyptian writer and Nobel laureate Naguib Mahfouz. It is also known by its Egyptian dialectal transliteration, Awlad Haretna, formal Arabic transliteration, Awlaadu Haaratena and by the alternative translated transliteral Arabic title of Children of Our Alley. It was originally published in Arabic in 1959, in serialised form, in the daily newspaper Al-Ahram. It was met with severe opposition from religious authorities, and publication in the form of a book was banned in Egypt. It was first printed in Lebanon in 1967. An English translation by Philip Stewart was published in 1981 and is still in print; when Stewart refused to sell his copyright, Doubleday commissioned a new version by Peter Theroux. It was this book that earned Naguib Mahfouz condemnation from Omar Abdel-Rahman in 1989, after the Nobel Prize had revived interest in it. As a result, in 1994 – a day after the anniversary of the prize – Mahfouz was attacked and stabbed in the neck by two extremists outside his Cairo home. Mahfouz survived the attack, yet he suffered from its consequences until his death in 2006. The story recreates the interlinked history of the three monotheistic Abrahamic religions (Judaism, Christianity, and Islam), allegorised against the setting of an imaginary 19th century Cairene alley. Critics claimed that Gabalawi stands for God. Mahfouz rejected this, saying that he stood for "a certain idea of God that men have made" and that "Nothing can represent God. God is not like anything else. God is gigantic." The first four sections retell, in succession, the stories of: Adam (Adham أدهم) and how he was favoured by Gabalawi over the latter's other sons, including the eldest Satan/Iblis (Idris إدريس). In subsequent generations the heroes relive the lives of Moses (Gabal جبل), Jesus (Rifa'a رفاعة) and Muhammad (Qasim قاسم). The followers of each hero settle in different parts of the alley, symbolising Judaism, Christianity and Islam. The protagonist of the book's fifth section is Arafa (عرفة), who symbolises modern science and comes after the prophets, while all of their followers claim Arafa as one of their own. Central to the plot are the futuwwat (plural of futuwwa, 'strongman'), who control the alley and exact protection money from the people. The successive heroes overthrow the strongmen of their time, but in the next generation new strongmen spring up and things are as bad as ever. Arafa tries to use his knowledge of explosives to destroy the strongmen, but his attempts to discover Gabalawi's secrets leads to the death of the old man (though he does not directly kill him). The Chief Strongman guesses the truth and blackmails Arafa into helping him to become the dictator of the whole Alley. The book ends, after the murder of Arafa, with his friend searching in a rubbish tip for the book in which Arafa wrote his secrets. The people say "Oppression must cease as night yields to day. We shall see the end of tyranny and the dawn of miracles." 1990, Israel, Am Oved , Hebrew translation by David Sagiv as Children of our neighborhood בני שכונתנו, end notes by Prof. Sasson Somekh. ^ Hafez, Sabry: "Introduction" to The Cairo Trilogy. Cairo: American University in Cairo Press, 2001. pg xxxiv. ^ Hafez, op. cit., pg. xlii. ^ Mahfouz, Nagib (1990). Beni Shconatinu בני שכונתנו. Tel Aviv, Israel: Am Oved. 1. Children of Gebelaawi, 1997 edition (referenced above), introduction, pp. vii-xxv. This page was last edited on 3 November 2018, at 23:10 (UTC).